Christopher Hartshorne’s intricate woodcut prints reference organic forms and capture the frenetic energy of scientific processes. Combining simple elements to create complex structures, his process shares a kinship with the biological. 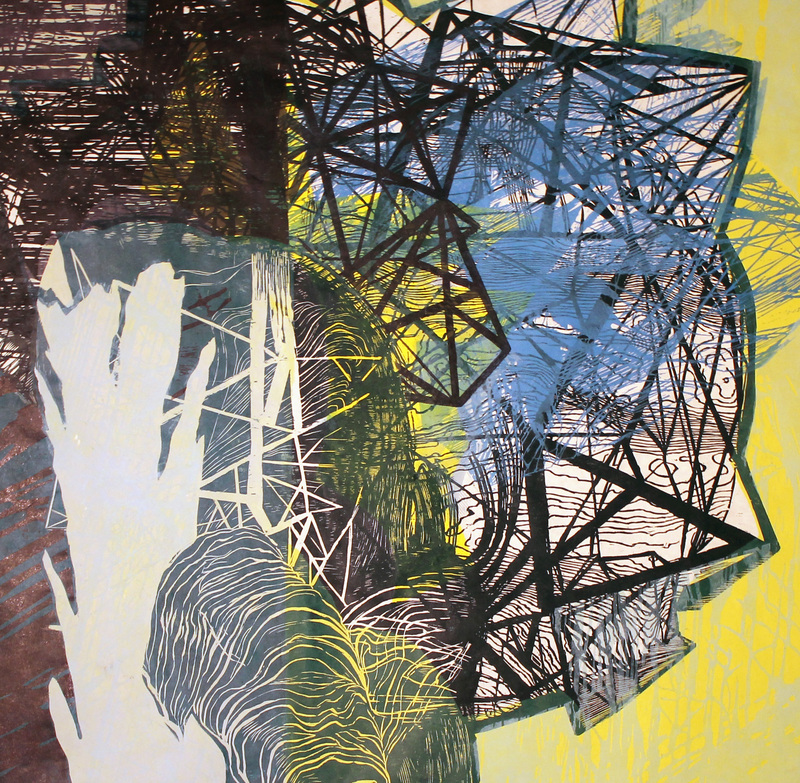 For the exhibition Crash Blossom, the artist prints with a collection of woodblocks created over the past six years. Although Hartshorne has printed finished works from these woodblocks, he now uses stencils to define new compositions before printing. Each composition is not just a section of a previous work, but a new image created from multiple sources. 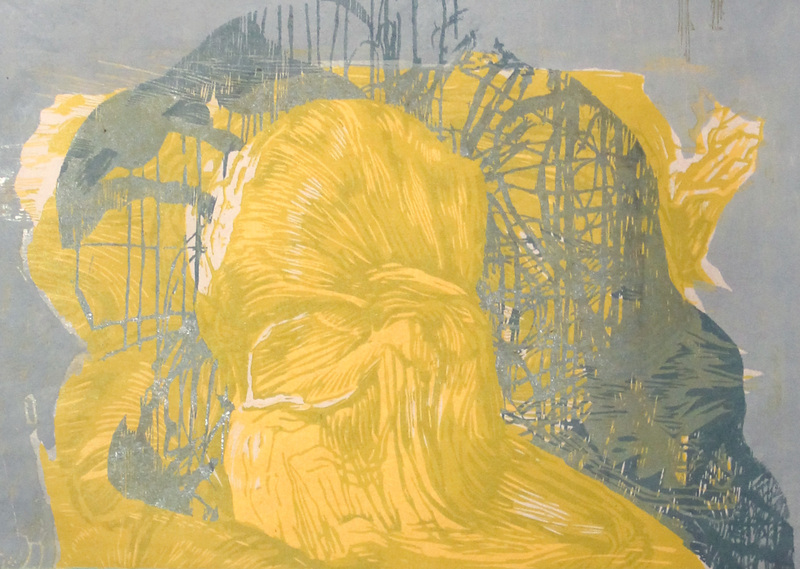 The idea of the template is intrinsic to both printmaking and genetic replication, affording the analogy that Christopher Hartshorne’s woodblocks are like DNA, creating a link between process and subject matter. Because of the commonalities of organic structures, the artist’s indirect references to natural forms avoid the specificity of a single image. Hartshorne’s ability to repurpose these basic components to create new forms suggests not just a collection of visual materials but a visual language. The exhibition title Crash Blossom, a term referring to the ambiguous syntax of news headlines, underscores this correlation with language. The abstract nature of the Hartshorne’s work contributes to its ambiguity and allows for a suggestion of not only natural forms but also natural forces. His work provides an overwhelming, visual experience with constant motion and sheer detail. The viewer is immersed in a chaotic, nebulous landscape, bombarded by organic materials. These tumultuous scenes with their organic references suggest environmental disasters and chemical reactions. In the artist’s works prior to 2009, this chaotic atmosphere served as a background element depicting a figure’s inner turmoil. With these more abstract works, the artist’s focus has shifted from suggesting a figure’s psychological state to altering the viewer’s state. Although the intention has shifted, works like False Front still suggest a figurative presence to invoke a shared response with the viewer. 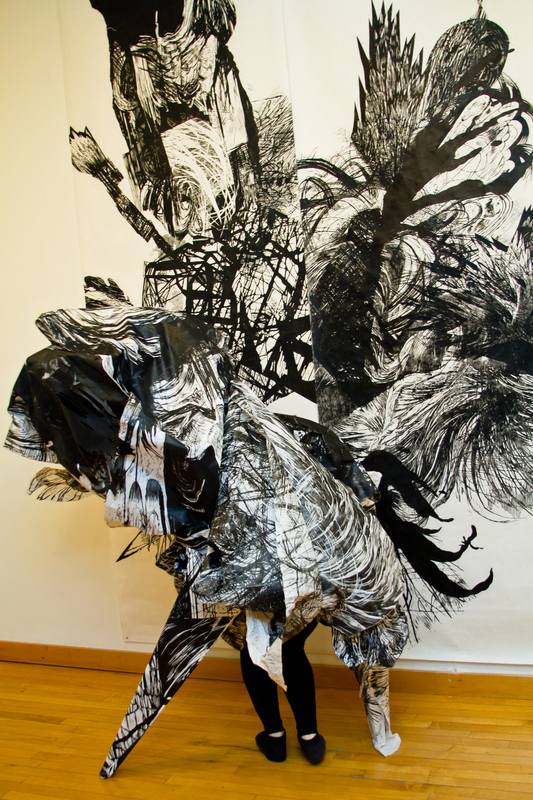 For his 2012 Wind Challenge exhibition at the Samuel S. Fleisher Art Memorial, Hartshorne added a performance element to his work- a moving figure wearing a monstrous headpiece covered in patterns similar to a print it moved in front of. In this exhibition at NAPOLEON, his work continues to explore the idea of immersion. With a visual language to draw from, his work, like his biological references, is a process of growing complexity. Alison McMenamin is a regular contributor for theartblog.org. She is a graduate of Moore College of Art and Design’s Photography and Digital Arts department. To download a .pdf version of this essay, click Forces_Not_Forms_Chris_Hartshorne.